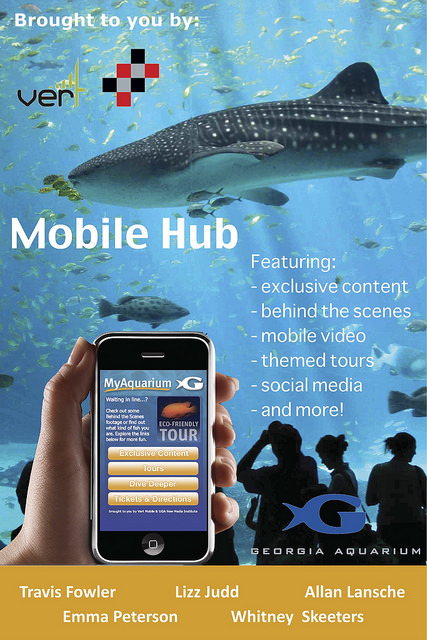 Once the NMI students were linked up with the Georgia Aquarium and Vert Mobile, they sought to create something that users would appreciate and that would clearly promote their client in an effective way. The mobile website would offer necessary information about the Aquarium along with entertaining features like fun facts, trivia, quizzes, exclusive content and tours. The mobile hub is something guests can use inside of the venue and can continue to use long after they leave. It also guarantees anyone with a smart phone can spend an extended period of time interacting with exclusive and entertaining information about the Aquarium. It deepens their relationship with the attraction and makes guests feel closer to the Aquarium by experiencing it in a variety of ways. The mobile hub offers one more way for guests to feel connected to and to receive information about one of their favorite attractions, the Georgia Aquarium.